As some of the Cruz supporters continue to scream "he's not a conservative" and "you're really f**king stupid" to the poor Trump supporters, it is refreshing to see that these attacks have not moved the polls as intended. Rush Limbaugh has the best analysis of why Trump is leading. 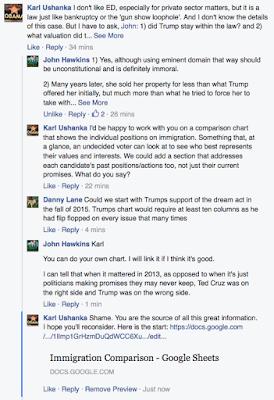 Do not listen if you are not tolerant of views other than your own... Redistributed from Doug's site. The attacks these past two weeks remind me of the Ron Paul(bots) of previous elections, and I wonder if they are the majority of the vocal name-callers and are giving the Cruz supporters a bad name. 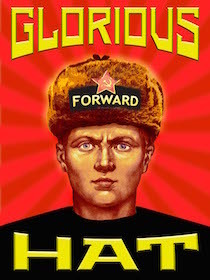 The Paul-bots, if you don't remember, would swarm anyone online, or any poll online. No intellectual discussions, just swarm and overwhelm any discussion that either ignored Ron Paul or put him in a bad light. 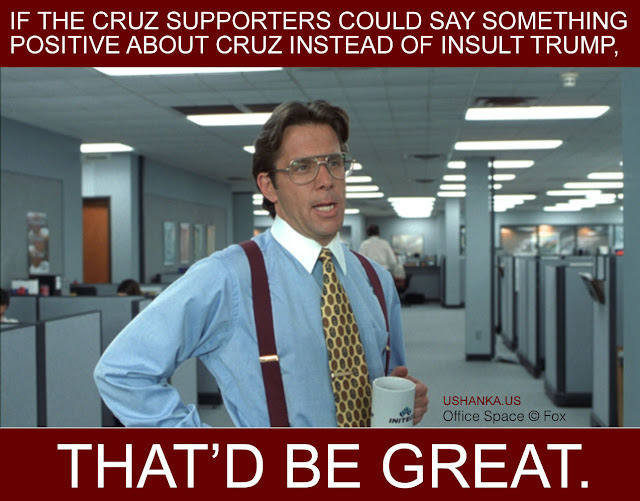 I'm seeing the same behavior with the Cruz supporters now, and while I know it is just a few, it is getting old real fast. If you are a Cruz supporter, by all means engage. But tell everyone something positive about Ted Cruz. Persuade. Don't insult. 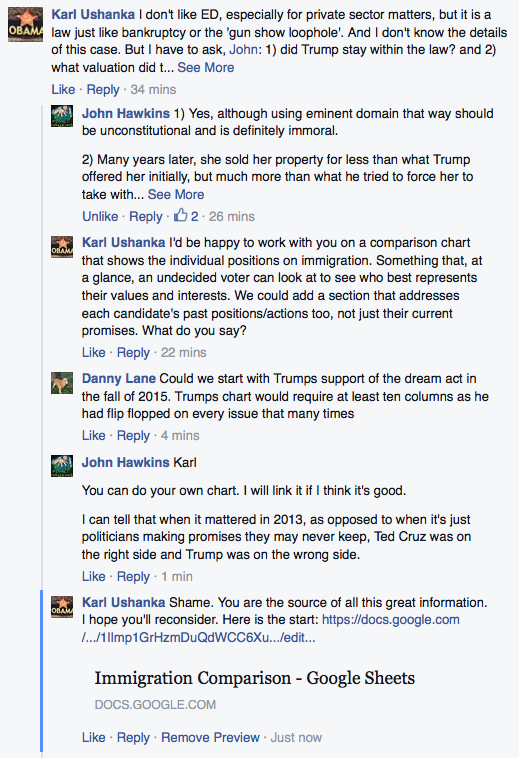 You can use the format of my Trump post as an outline. I'm keeping a mental tally of those people who are against Trump (which seems to mean pro-Cruz). In several weeks either they will be celebrating as Cruz takes the nomination, or they will be bitter for the next 10 months, ready to gloat if the GOP nominee fails to win the general election. Perhaps they will also be quick with the "I told you so" when (not if) President Trump does something less-than-conservative. Rush Limbaugh. Despite his excellent analysis above and over the past two weeks, it is my guess that Rush is in the bag for Cruz for this reason alone: Rush says the GOPe hates Cruz more than they hate Trump. And he never explains why. I think this is a way to push voters to Cruz without coming out and saying why. Rush knows this is an anti-establishment election, on both sides, and his saying this with ZERO supporting evidence, tells me he's for Cruz, but not so much he's willing to lose some of his audience. John Hawkins (RightWingNews). Here are some of John's tweets between Jan 20-24. I think these were meant to deceive, distract and manipulate. None of his comments were sourced, for example. I also think they are unbecoming of a leader in the new-media. I've told him this in my FB replies. If Trump's the nominee, Republicans will have to root for Obamacare to stay in place, because his single payer system is even worse. George Bush had better favorable/unfavorable numbers when he left office than Trump does right now. People who slime Trump supporters or refer to Trump as a fascist/Hitler deserve to be ignored, disrespected and tuned out by conservatives. What makes anyone think a flip-flopping moderate like Trump would make deals they'd like better than a country club Republican like Boehner? Wow, Bloomberg might run? He's a moderate billionaire, can't be bought, speaks his mind & has "New York Values." It's like they're twins! Donald Trump is so much of a squish that he makes Lindsey Graham look like Rush Limbaugh. Why don't we draft Warren Buffet as the GOP nominee? He's not conservative, but neither is Trump. He's also richer & less erratic. #‎improve? If someone tells you that at least Trump keeps his word, it's a sign they don't know that much about him. If Trump is our nominee, it's an auto-win for the Dems. Obamacare's permanent. Prolly 4 Supreme Court Justices. Executive orders all stand. I don't ever link or push anything that refers to Trump as a "Hitler" or that trashes his supporters. That's obnoxious. Shorter Trump: Elect me and I'll be another John Boehner! Wait, what? You can't stop Trump, but you can contain him. Savage him enough & then he won't have enough support to win when the primary field shrinks. The RNC was right to pull National Review's debate invite for bombing on Trump. It was still worth it for them to do it. Trump has never voted in a Republican primary, said W. is the worst POTUS in history & was supporting Democrats & amnesty just 3 years ago. I'm going to be do everything I can to stop Trump from getting nominated. If he wins, I'll do what I can to help, but it will be hopeless. Why are the polls showing Trump ahead relevant, when the polls showing his 33% favorability rating are treated like they don't matter? John endorsed Cruz on the 30th. 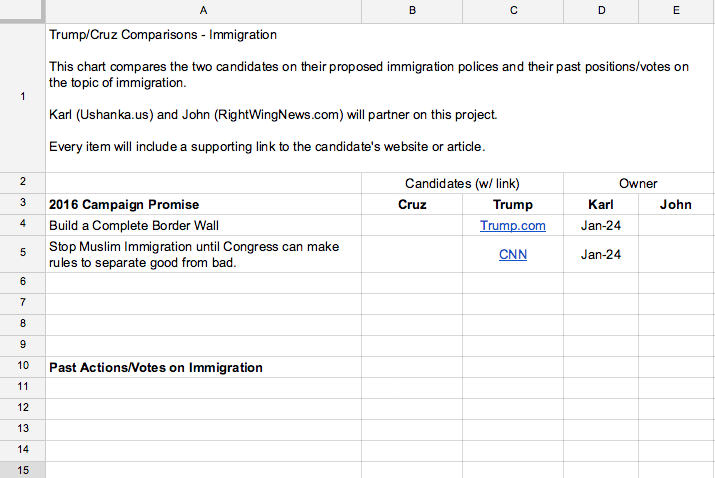 I offered to partner with John on a comparison between Cruz and Trump on immigration. You can see his decline here. 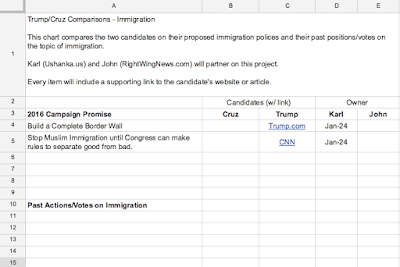 Any ideas why he avoided this 5-min chore to help communicate the candidates' position on immigration? What I can't predict is how the conservative movement will work together after the childish and rude attacks from the Cruz supporters. I just hope the Trump supporters continue to ignore the cheap shots. 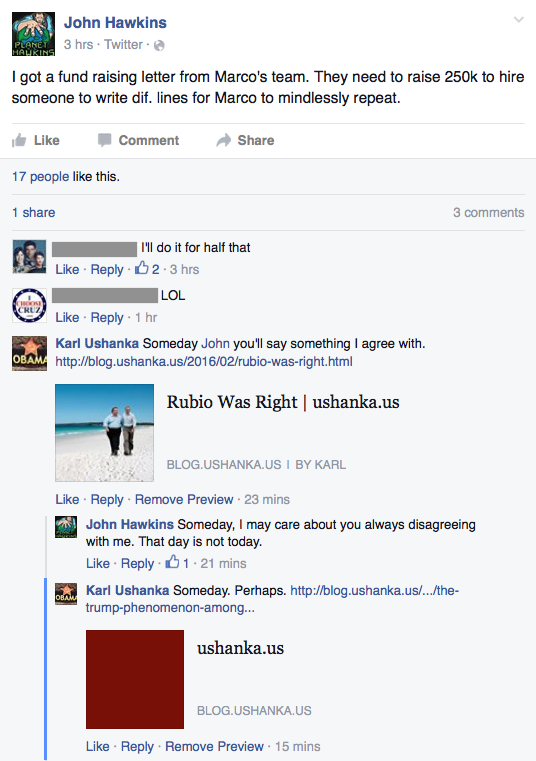 Comrade John Hawkins does not tolerate insubordination! The "Rubio Was Right" post I linked to. The 2nd link was to this post. 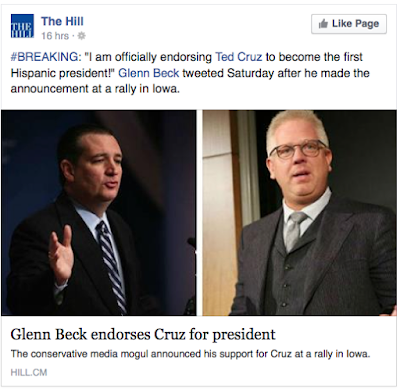 Diane Marshall helps frame the Trump phenomenon in this response to the once sane Glenn Beck. I stopped listening to Rush in the late 90's. Everything he mentions had lots of help from Team R all the time. He kind of acknowledges that. I did support Ron Paul and it is clear the Republican Party cheated him in some cases illegally of delegates. That tells you a lot right there about the system. I will always be disgusted with Rush for putting down Ron Paul. Conservative is just another name for statist. But I did laugh at those putting down Trump as not 'conservative'. What does it matter at this point? Anyway, I guess we can only hope that Trump if he won has some ego investment in doing things like curtailing illegals and maybe no more costly foreign adventures. Rush is a businessman first, a conservative second. I still learn a lot when I tune in, but I also question everything he says now. I think your comment about Trump's ego is spot on. His promises carry more weight with me because I think he'll suffer more if he fails. You can't build the buildings and businesses he has and think he'll do a half-assed job then rationalize his failure or blame others.